Oral B Floss is one of the best quality dental flosses available. I use it myself most days! But some of my patients tell me they have trouble flossing. They find that their teeth are very tightly in contact with each other. Getting the floss between the teeth is a problem. Sometimes, the floss just shreds, leaving tiny filaments jammed between the teeth. Frustrating! Other times, the floss goes between the teeth if you push hard enough, but then it hits the gum with a whack! Ouch! I want to tell you about a couple of things I have found over the years, that have helped my patients! Oral B floss. The regular Floss is a great product, and for many people it works well. I recommend the waxed type. Oral B Satin Tape. Watch for the word TAPE. This comes in a packet that looks identical to the floss. AND I MEAN IDENTICAL ! I have even been fooled myself a few times, when I thought I had bought Tape. I got home to discover that I had actually bought floss! Oral B Tape is like floss that has been ironed. It looks like a miniature measuring tape; thin and flat. Guess what - that thin Tape will go right between your tight teeth MUCH more easily than normal floss! 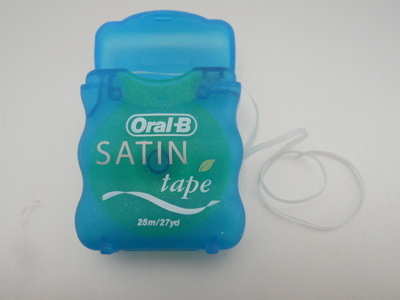 So, if you are having problems with conventional floss, or gave up on it years ago, give Oral B Satin Tape a try! Use exactly the same technique as for regular floss. 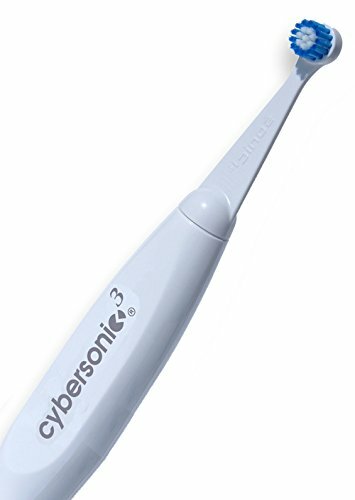 For a great toothbrush, I HIGHLY recommend the Cybersonic 3 to my patients. Click HERE to learn more about this toothbrush, AND to get your special HALF PRICE DISCOUNT CODE. My instructions on How To Floss Teeth. When I first started flossing as a dental student, I could only do the front six teeth at first! But as the weeks went past, I gradually got better at it. It just takes time and practice. Get your floss out, and take off about 18" of dental floss or dental tape. Wrap the last 6" of one end round your middle finger of your left hand, and the last 6" of the other end round your right hand middle finger. Now take the short middle bit (about 2 ") between your first finger and thumb of each hand. It's important that this bit is quite short because then you can keep it stretched tight. Now gently wiggle it down between two teeth, keeping the short bit between your fingers tight. It should slide between the teeth. Make sure the floss is headed straight through between your teeth. Usually this means having one first finger in behind the teeth you are flossing. NOW you need to pull that short section of floss over onto the tooth on one side, and wiggle it gently under the gum, up and down. If the gum bleeds a little, don't worry - it's a sign that you're getting the floss in the right spot! The gum is bleeding because you left plaque there before! Flossing should not hurt. If it hurts, then you pushed too hard! Go gently! At first, you may only floss a few teeth near the front of your mouth. As you get better at it, it gets easier, and you can start to floss a little further back. Just "add" one tooth each side per week. After 4 to 6 weeks, you should be able to floss ALL your teeth. Sometimes it takes a bit longer, but keep at it! You WILL get better, the longer you keep trying. Regular Floss or Oral B Tape? I recommend the Oral B Satin Tape for all my patients, unless you are already using regular Oral B Floss and have no problems. 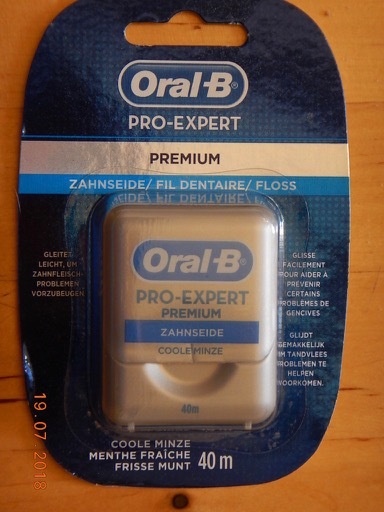 UPDATE 2018 - EVEN BETTER is the Oral B Pro Expert tape, available from Amazon. I hope these instructions on how to floss teeth are useful.